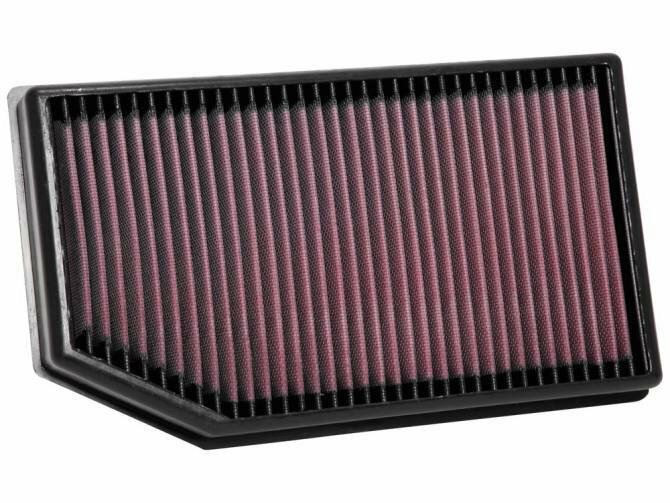 This K&N Replacement Air Filter is specifically designed to work with your 2018-2019 JL Wrangler's 3.6 L or 2.0 L turbo engine. It delivers increased horsepower and acceleration while giving your high air flow and excellent filtration. Depending on your driving conditions, you can go 50,000 miles before having to clean this filter. When you do have to clean it, you can easily wash it and reuse it. Not only does this speak to the quality construction of K&N's air filter, it will also save you money on replacing filters frequently. It's emissions legal in all 50 states and won't void your vehicle's warranty. Installation is as easy as removing your old filter and dropping this one in. This Drop-In Replacement Air Filter from K&N is specifically designed for long lasting durability with No modifications necessary! Direct Replacement: Easily replace your factor air filter with this quick Drop-In K&N Air filter. This filter will work with original equipment manufacturer vehicle electronics and is emissions legal in all 50 states. This Air Filter will not void your vehicle's warranty. Filter Construction: K&N air filters are constructed using 4 to 6 layers of cotton gauze, which is between two epoxy-coated aluminum wire screens. The cotton is treated with a formulated oil, which is designed to capture dust particles, allowing for a cleaner air to pass through to the engine. K&N filters can last up to 50,000 miles before needing to be cleaned. High Performance Add-on: K&N is the original manufacturer of high-flow air filters. K&N Engineering has designed this filter for the enthusiast interested in maximizing horsepower, acceleration, and fuel-efficiency. Washable and Reusable: When needed, you can clean this filter by easily washing it and then reusing it, which will save you money on replacing filters frequently.